Vice President Joe Biden cited the administration’s belief that sexual orientation is an important element of diversity before swearing in last week the first openly gay U.S. ambassador nominated by President Obama. “I believe and President Obama strongly believes that America projects its best face to the world when it reflects the true diversity of our country — whether it’s race, religion, gender or sexual orientation,” he said. 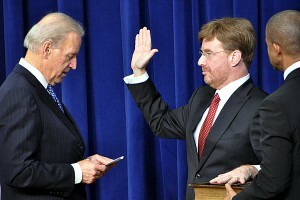 Biden made brief remarks before swearing in David Huebner as the U.S. ambassador to New Zealand and Samoa. The U.S. Senate confirmed Huebner for the role last month. Standing next to Huebner during the ceremony was Duane McWaine, his partner of 20 years and a psychiatrist. The mothers of Huebner and McWaine also were in the audience, and were escorted by Biden. The vice president said that Huebner wasn’t chosen for the ambassador position because of his sexual orientation; Biden noted that Huebner’s professional accomplishments qualified him for the role. Most recently head of the Shanghai-based China & International Disputes division for the law firm Sheppard Mullin Richter & Hampton, Huebner also has a history in LGBT activism. He served as a board member of the Gay & Lesbian Alliance Against Defamation and served as the group’s general counsel, according to a GLAAD statement released when Huebner was nominated. Huebner mentioned his sexual orientation in remarks following his swearing-in ceremony, and noted the U.S. affords him the opportunity to serve as ambassador even though his family came from humble beginnings and he’s gay. The appointment of Hueber makes him the third openly gay ambassador to serve the U.S. President Bill Clinton nominated James Hormel as U.S. ambassador to Luxembourg, and former President George W. Bush nominated Michael Guest as U.S. ambassador to Romania.